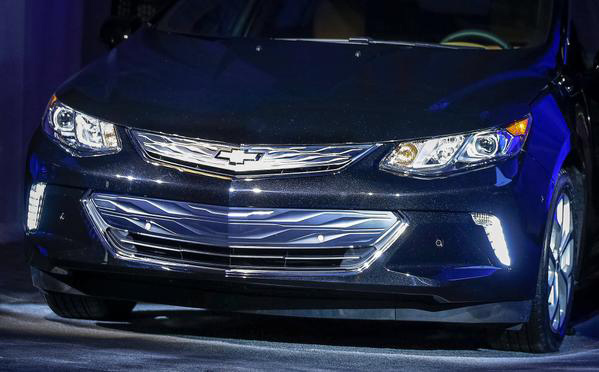 Chevrolet pulled back the sheet on the 2016 Chevrolet Volt at a press event Sunday night at the 2015 International CES in Las Vegas. Press in attendance were treated to a glimpse and photo op of General Motors newest long range electric/hybrid vehicle. GM has been showing some VIP volt owners and others, their latest vehicle over the last few weeks. Next week they will officially debut the 2016 Chevrolet Volt at the International Auto Show in Detroit. The Volt made it’s original debut in 2008 at CES when former GM CEO Rick Wagoner drove it on stage at a CES Keynote, reports TheVerge.com. Now in 2015 General Motors is retooling the drivetrain, features and looks for the 2016 automotive year. The reveal was reportedly quite short with it taking up just a fraction of GM’s press announcements at this years CES press event. For the most part, GM was showing off their new connected car products. Autoblog.com reports that the new 2016 Chevrolet Volt will use a new 1.5 liter gasoline engine that won’t require premium fuel. It’s also expected to have much longer EV range whereas the original could only go “a few miles” on battery before switching back over to fuel a concept that Toyota has mastered in it’s Prius line. We’re expecting to hear all about the newest EV vehicle when Chevrolet has their Keynote in Detroit next week.